If you have found Tohotweb as your home page, you should know that you are under attack of a browser hijacker. A browser hijacker is a potentially unwanted program (PUP) that attacks your browser and does a lot of changes without asking for your permission. This particular hijacker can infect a wide variety of browsers, and this includes Mozilla Firefox, Internet Explorer, and Google Chrome. You should know that hijackers are not very dangerous in comparison with other online infections: they are not as intrusive as Trojan horses or as threatening as ransomware. Nevertheless, you should still remove Tohotweb from your personal computer, and there are quite a lot of reasons for this. 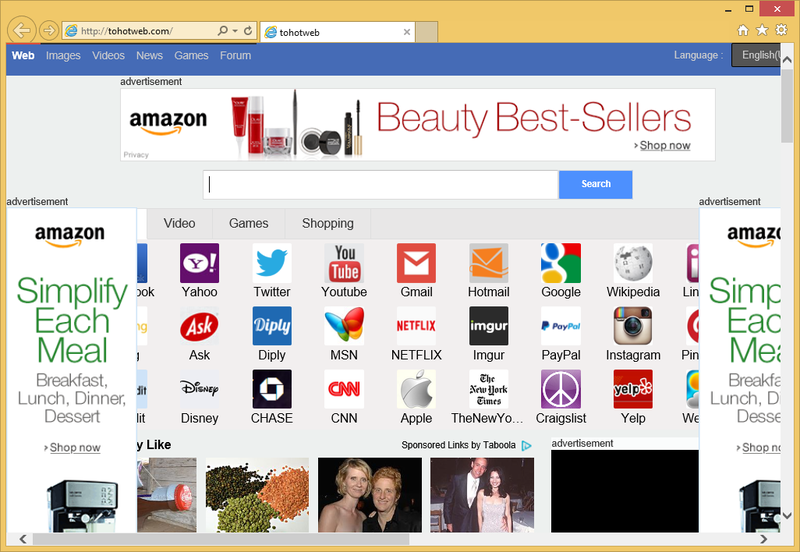 You may have probably seen that the homepage, default search provider, and new tab window of your browser are gone. Actually, they have been replaced by Tohotweb.com, a website that you should not visit. Why is Tohotweb considered dangerous? The moment you open your hijacked home page, you can see that something is definitely wrong. The main page of Tohotweb is rather interesting: there are a lot of links to various popular websites and weird pop-culture articles. It is also worth mentioning that advertisements are literally everywhere on your screen: at the top, bottom, and both sides of the window. This instantly indicates that something is wrong and that the page should not be opened ever again. The ads include banners, pop-ups, quizzes, etc. They belong to unknown third parties that may create malware. If you accidentally click on a dangerous ad, you can be immediately sent to a corrupted page and make your computer heavily infected. The PC might become slow, it may freeze or crash occasionally. Do not worry too much: the problems should be over once you install a good security tool and scan your computer with it. What is more, we can see that the browser hijacker uses google.com results for your search queries. Be careful: these results can be filled with sponsored links from third-parties. Moreover, non-personal (and, perhaps, even personal) information can be collected by the PUP. Delete Tohotweb so that your troubles would end. How did my computer get infected with Tohotweb? Well, there is no button on the official website to make Tohotweb your home page. This means that the browser hijacker is spread in free software bundles. Such bundles are usually downloaded from file sharing websites. If you want to avoid such troubles in future, choose the Custom or Advanced type of installation so that downloading freeware would be safer. Do not forget to read everything cautiously. How to remove Tohotweb from my PC? The most effective way to uninstall Tohotweb is downloading a professional malware and spyware removal application WiperSoft (100% Free , no hidden fees). The security tool is all you need: it will scan your PC system and eliminate all the potential threats from your computer. To sum up, Tohotweb removal will be easiest if you do it automatically.